This is the first towel on my current warp of ringspun 8/2 cotton (bought at M&R Yarns while on a road trip to Georgia). 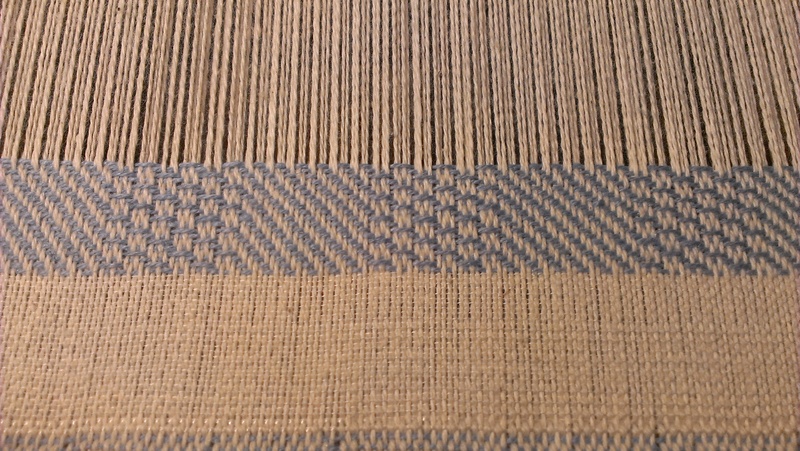 The weft is Borg’s 22/2 cottolin in light blue. 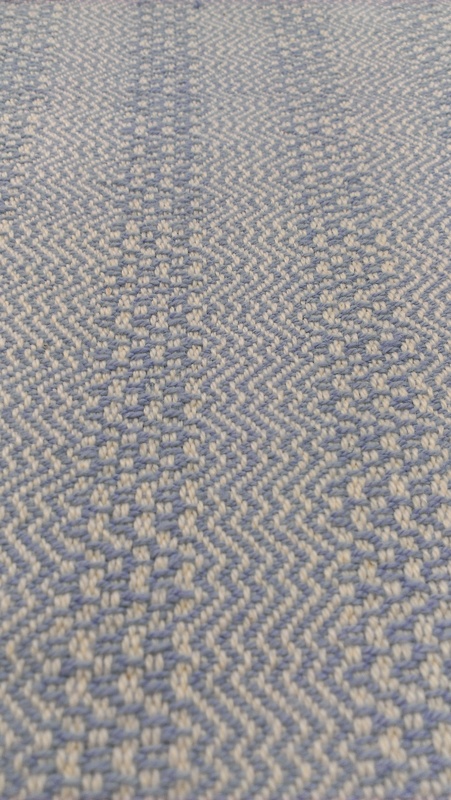 I got a copy of Davison’s A Handweaver’s Pattern Book, I studied it looking for a nice twill that had some threading changes so it wasn’t all one pattern and with some nice treadling variations to keep me on my toes. I chose the Caroline Halvorsen patterns on pg. 44. Above is Halvorsen I. This is the second towel on my warp. From Davison p.44 Caroline Halvorsen II. The first treadling was the easiest. 4,3,2,1. The second was a slightly longer sequence of 8 picks. 4,3,2,1,2,3,4,1. The treadlings get progressively more complicated in 3 & 4 but should be fairly quick to memorize as well. I am halfway finished with towel #2 and should start on #3 later today. Here is the draft for towels 1 and 2. 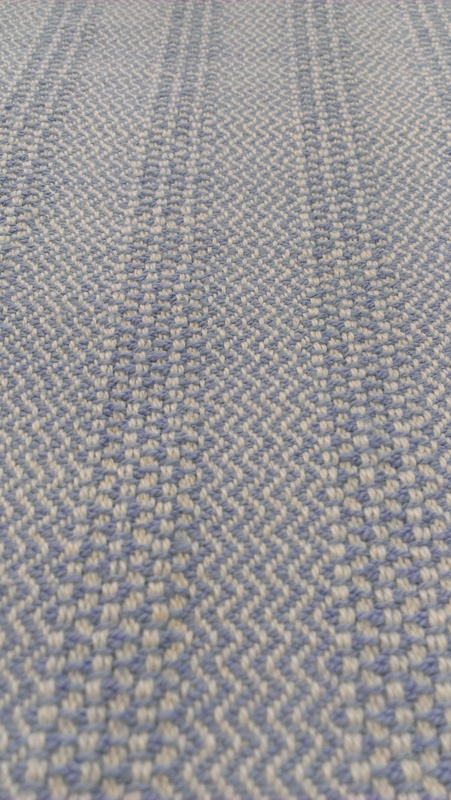 There are plain weave sections at the beginning and end of each towel. 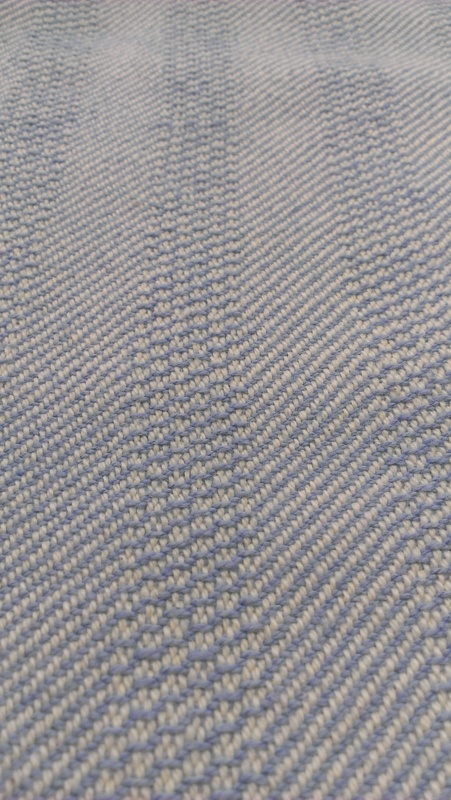 I am using a floating selvedge since there are some point twill treadlings. I hope to finish all 4 before my study group meeting at the WGGC on Wednesday. Yes the auto reed hook kept me from skipping a dent yesterday, but it didn’t prevent user error. You can see in the picture above slightly left of center what the problem is. 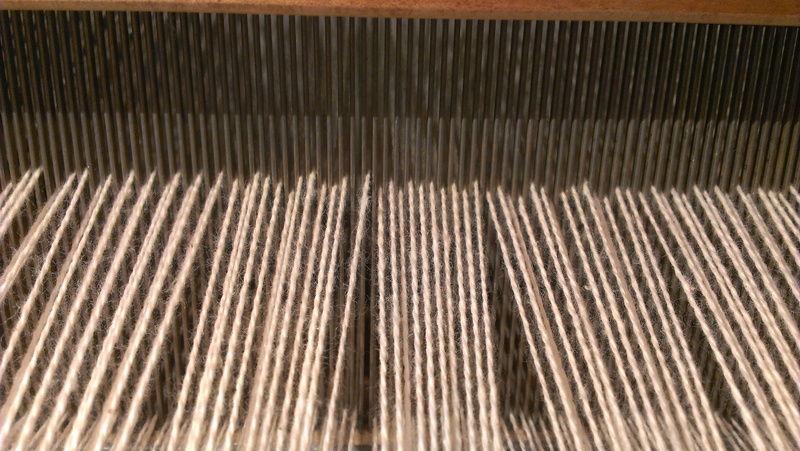 I got my whole warp sleyed and tied on, then it was time to check for issues. 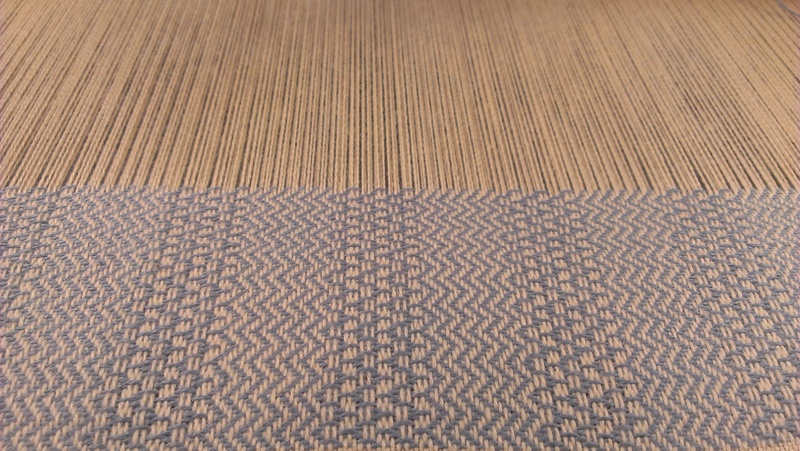 I treadled some plain weave sheds and I examined the sheds from the front of the loom. Each dent should have two threads and when treadling the plain weave shed, one in each should move up and the other stay down. But, I saw an empty dent when I treadled the sheds. With the shed closed and flat, I hadn’t noticed it, but two of the dents only had one thread in each instead of two. When I raised a shed, the thread in one of the dents that only had one thread stayed down and there was a one dent gap. Fortunately the dents with one thread each were right next to each other. I contemplated leaving it, but it could leave a reed mark in the finished cloth. Since it was only about 4 inches away from the left selvedge, I fixed it and resleyed those 4 inches. If it had been in the middle, I probably still would have fixed it and resleyed 11 inches of warp. I also looked into the sheds from the side and found 2 threads in the middle of the shed. I had twisted them between the heddles and reed. So I marked the threads with a piece of red string from a thrum and located the bout and untied it. 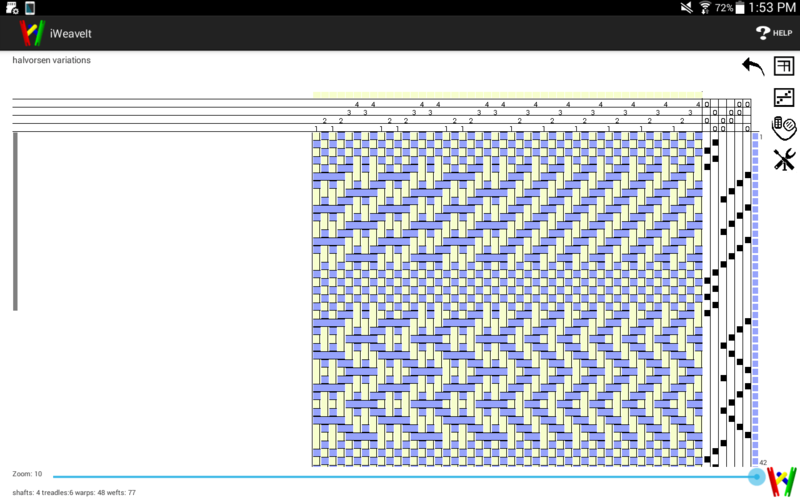 I traced the threads back and sorted them out, resleyed them and retied the bout. 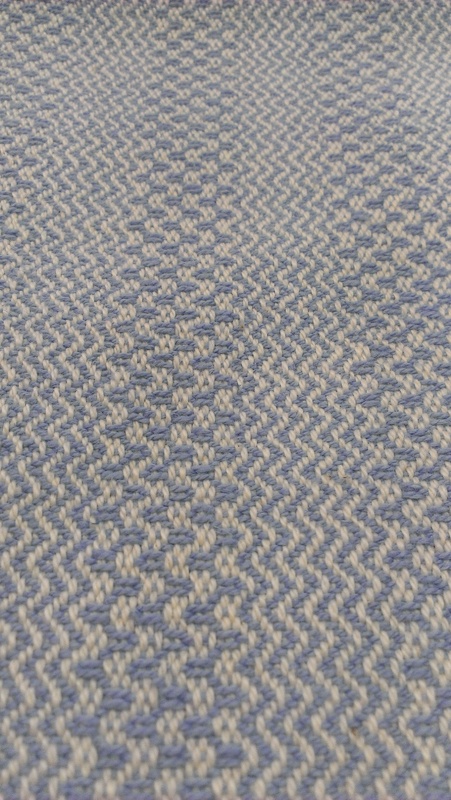 I always look for problems before I start weaving. That is the best time to fix things. I don’t want to go through all the work that it takes to weave something only to have a flaw in the finished product that I was too lazy to fix. I am like this with my knitting too. If I can fix it, I do. I have been know to rip out almost completed knitting projects. My philosoply is that if the mistake will bother me, I won’t want to wear it or give it to the person it is intended for. I like knitting and I like weaving so ripping out or unweaving may take me a little longer to get that particular project finished, but I still get to knit or weave and will like the sock or the towel better. See this sock , it was a project I started last year during the winter Olympics. Shortly after this picture was taken, I ripped it out even though there were no errors in the knitting. I tried it on, and it was really tight. I didn’t take into consideration how the twisted stitches would affect the stretch of finished sock leg and they were intended for me. My daughter who has thinner legs said she probably would not wear them. I still had one sock to go, so I ripped. I want something that fits. I will restart them on dpns (2.25 mm) for the leg with the same number of stitches. That will give a little more stretch. Then when I get to the foot, I will switch to two circular needles, one for the top of the foot in size 2.5 mm needles and stick with my usual 2 mm(US size 0) for the bottom of the foot. That should do the trick. 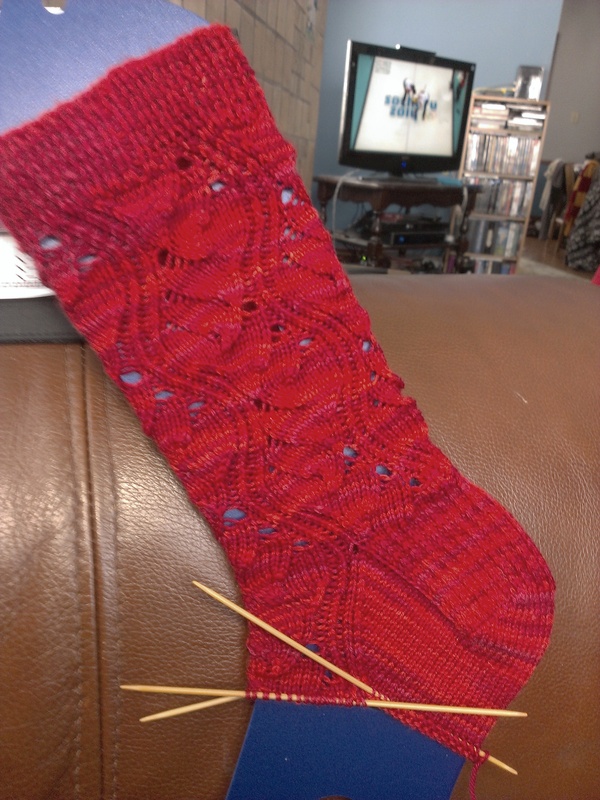 Meanwhile, I do have other socks on the needles. 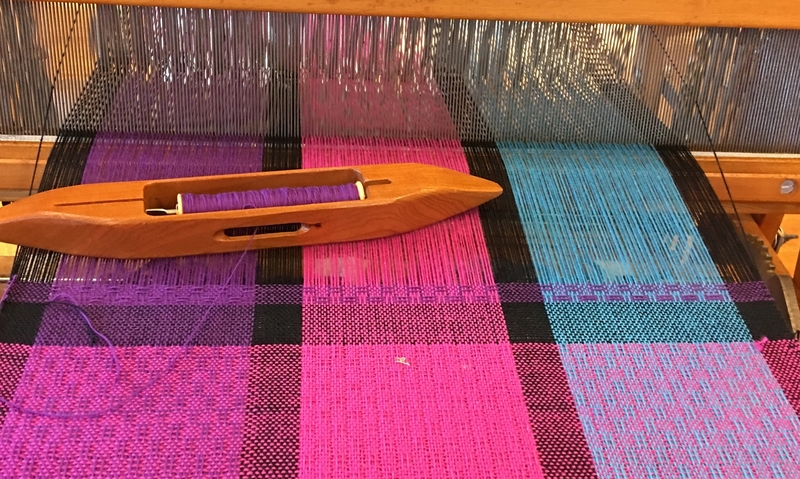 I am trying to weave during the day and knit in the evenings, but have instead been working on weaving into the evenings since my days have been interrupted here and there by normal life. 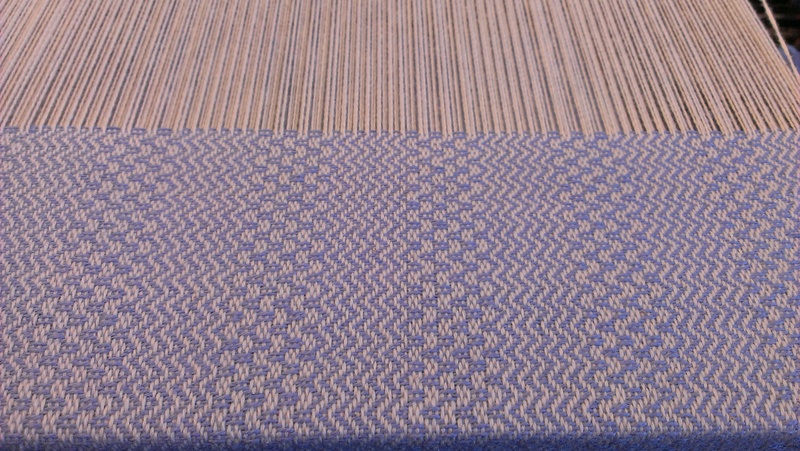 Well, now its back to the loom to finish the last inch of resleying and hopefully to start weaving.